How did we already make it to the middle of the week? I feel like this week I have been in go go go mode! But I can't complain I like to be a bit busy! Last week I mentioned in a post that I was having a bit of trouble with my ankle. Well I finally sucked it up and went to Sports Medicine to have my ankle checked out. And the results are in.. I have a very tiny stress fracture on the inside of my left ankle (well no wonder it hurt to run)! I have to say I am not completely shocked with the results but I am relieved that my pain is not caused by something worse! Thankfully my stress fracture is tiny which is great news. While I have to take a month of from running (queue sad face) I am thankful that I am still allowed to do low impact cardio and weights. I would go crazy if I couldn't work out. Along with the low impact cardio my Doctor recommends lots and lots of stretching and focusing on a well balanced diet. She wants me to focus on getting all the proper nutrients with a emphasis on calcium (gotta build strong bones)! A siren went off in my head with the word calcium, because I know I don't get as much calicum as I need! Since my doctors appointment I have been looking for small ways to up my intake of calicum! One of my 2012 goals was to continue on the path of healthy living (read about my 2012 goals here). Uping my calicum intake def. falls under that goal! One of the easiest things I can do is drink milk! I am going to aim for 2 glasses of milk a day! Unsweetened almond milk is my favorite! I am going to continue packing loaded yogurt bowls for a mid morning snack! 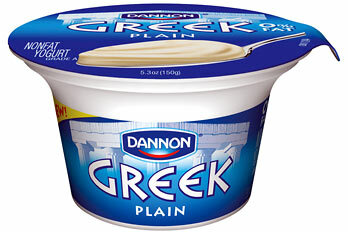 Not only is plain greek yogurt good for you, but its a blank canvas for healthy mix ins! Some favs are Trader Joes Trail Mix (nuts are another great source), Granola/cereal, and fresh fruit! I am going to up my intake of calcium rich veggies! Killing two birds with one stone! Veggies and calcium! And last but not least incorperate Chia seeds more into my diet (2 ounces of Chia Seeds have 600 MG of calcium)! Yes I use them every now and then in overnight oats, but people add them to salads, smoothies, and yogurt... the sky is the limit! A few small steps that will hopefully lead to big benefits! 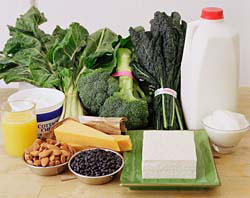 How do you sneak more calcium into your diet? I have been eating healthier and can really tell a difference. I need to get more calcium too. Sorry about your ankle, hope it gets better! Thank you! That is awesome that you can tell a difference! Hope all is well! Thank you! And good luck with the knee! I hope its nothing major! glad to hear that it is a tiny fracture and nothing that will keep you on your bum for a long time! i had a glass of milk last night and i remember thinking that i hadn't had milk in weeks. so bad. i def. need to up my calcium intake as well. And I am right there with you I couldn't remember the last time I had a glass of milk. Its just not something I reach for when I want a drink! Oh no, not a stress fracture! Glad it's small...hope it heals up quickly! I've become a huge fan of Greek yogurt....I think the Chobani strawberry banana is my favorite so far. Try mixing a container of yogurt in with your morning oatmeal (apple cinnamon, honey, vanilla, whatever flavor)...it's really good and packs some extra calcium AND protein! I added vanilla greek yogurt to my oats this morning and loved it! Thanks for the suggestion! I have never heard of sweet frog? Is it ice cream, if so sign me up! Hope all is well with you! great ideas! I eat greek yogurt with mix-ins for breakfast almost everyday, and I like to saute kale and mix it in with whatever I am having for dinner. It's yummy! I also try to make a couple of spinach salads per week to take for lunch. I don't drink as much milk as I probably should... but I take a calcium supplement! Thanks for the good ideas and the reminder about chia seeds---I have them but always forget to use them! im glad you went to the sports medicine doctor when you did to catch the stress fracture when it was small and didn't get bigger. take care of yourself hilliary!! Thanks meg!! I hope all is well with you! I hope you're feeling better! I use the chia in salads and hardly notice any more! I love them in smoothies, because it gives you something to chew on. A bit of substance, I guess. It is so important for us to stay up on our health and take vitamin/supplements when we need to. Good luck upping the ante! Our health is so important! I am going to try chia seeds in my salad today! Thanks for the well wishes! Oh, no! Get better soon! I love Greek yogurt, myself. I'm sorry to hear about the stress fracture, Hilliary! But at least it's only one month off and a tiny one. Maybe you can amp up yoga in the mean time. I love silk milk or coconut milk (I'm lactose intolerant), so those are my preferences. And Greek yogurt I only like with honey, lol. I have been meaning to try coconut milk! Yoga would be a great thing for me to start getting back into, it would def. help with stretching! Thanks for the suggestion! Hope all is well! I drink a lot of milk, greek yogurt and string cheese through out my day to up my calcium intake. I had no idea Chia seeds were so rich in calcium though, I like them but have never thought of incorporating them into more of my dishes! Thanks for the idea! :) ha Hope you heal quickly!!! Thank you! I need to buy string cheese! I always forget about it! Hope all is well! i think greek yogurt is what keeps me alive! It is so good! And thank you! !